Russia's military power deemed critical threat by 52% in U.S.
WASHINGTON, D.C. -- Russia's already negative image among Americans only worsened over the past year, with a majority for the first time saying that Russia's military power poses a threat to U.S. vital interests and a third identifying Russia as the United States' chief enemy. Meanwhile, the percentage of Americans viewing Russia unfavorably edged up a point to 73%. Each of these negative perceptions of Russia marks a record high in Gallup's trends. The Feb. 1-10 poll coincided the Trump Administration's Feb. 1 announcement that the U.S. is pulling out of the Intermediate-Range Nuclear Forces (INF) Treaty over concerns Russia hasn't complied with the arms control agreement. In the survey, 52% of Americans rated the military power of Russia as a "critical threat" to U.S. vital interests. This is up from 39% in the prior measure in 2016 and from 18% in the initial 2004 reading. Although sizeable segments of Republicans and Democrats view Russia's military as a critical threat, the figure is higher among Democrats (65%) than Republicans (46%). Americans are now more likely to name Russia than any other country as the nation they think is the United States' greatest enemy. Russia has displaced North Korea in the top spot, as mentions of Russia swelled from 19% in 2018 to 32% today. Meanwhile, mentions of North Korea plummeted from 51% to 14% following last year's dialogue between the two countries over denuclearization of the Korean Peninsula. What one country anywhere in the world do you consider to be the United States' greatest enemy today? China is also more likely to be seen as a top adversary this year, with 21% citing it versus 11% in 2018, pushing China into the No. 2 position while North Korea has fallen to No. 3. Iran, mentioned by 9%, continues to rank fourth, as it did in 2018. Gallup has asked Americans to name the country they consider to be the United States' greatest enemy 12 times since 2001. Russia ranked first in 2015, but with only 18% mentioning it. Besides North Korea, other countries cycling through the top spot include Iraq, Iran and China. As recently as 2016 there was no difference between the parties in mentions of Russia as the top enemy. However, as federal investigations into Russia's possible involvement with Donald Trump's presidential campaign have revealed Russian efforts to influence the 2016 election, views have grown more partisan. 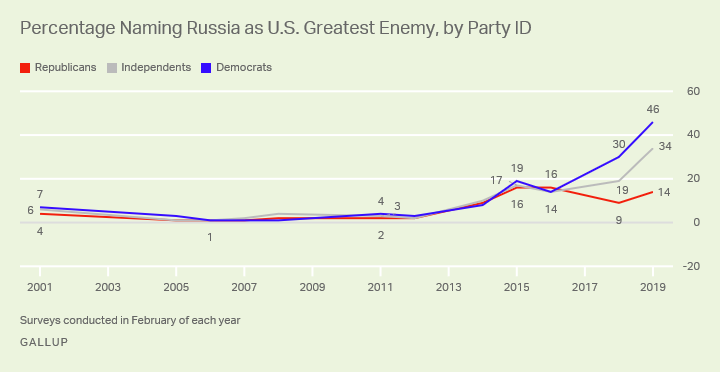 Nearly half of Democrats (46%) versus 14% of Republicans now view Russia as the country's top enemy. While Russia is the top choice of Democrats by a wide margin over North Korea (mentioned by 17% of Democrats), Republicans are more likely to name both China (22%) and Iran (19%) as the top enemy than name Russia, while 12% name North Korea. After nearly two decades of mostly positive favorable ratings in the U.S. following the collapse of the Soviet Union in 1989, Russia has consistently sparked more negative than positive ratings since 2013. Russia's U.S. favorable rating was 44% in February 2013, but dipped further in 2014 to 34%, after Russia had offered the former U.S. intelligence contractor-turned leaker, Edward Snowden, asylum. 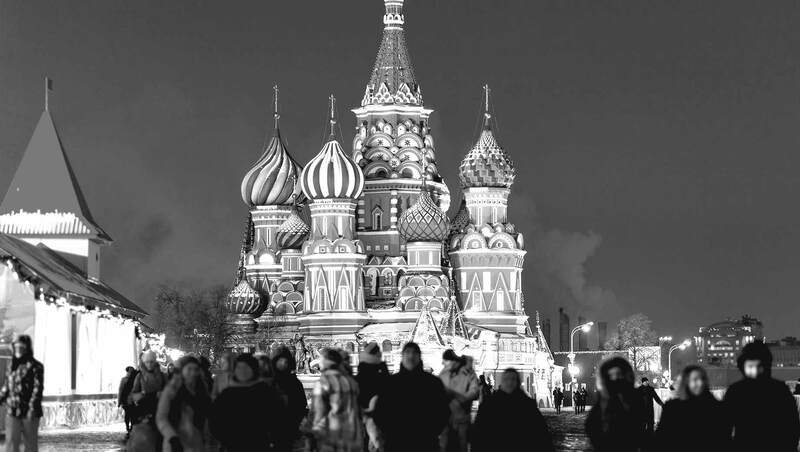 As Gallup noted at the time, Russia's deteriorating image may also have reflected growing U.S.-Russia tensions over the Syrian civil war, as well as controversy over aspects of the 2014 Winter Olympics which Russia hosted. Positive views of Russia have since dropped below 30% while more than 70% of Americans have rated it unfavorably. The 24% viewing it favorably today includes low levels of all party groups: 30% of Republicans, 23% of independents and 17% of Democrats. Even before Russian state television this weekend identified which U.S. military installations would be targeted should Russia launch nuclear strikes on the U.S., Americans had grown increasingly wary of Russia. This trend has continued under Trump, but it started during Barack Obama's presidency. 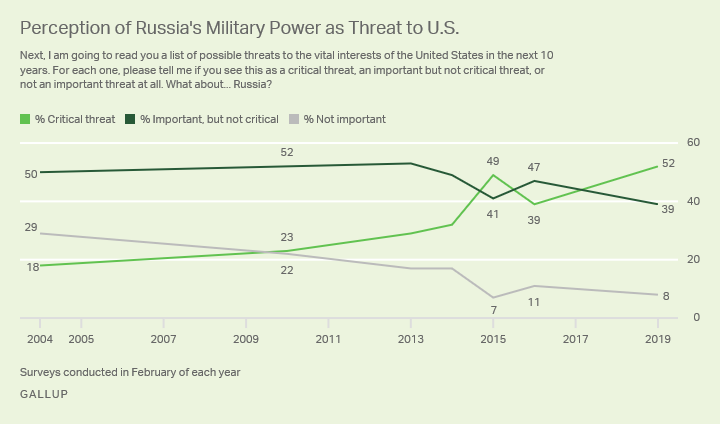 Today, Democrats are more critical than Republicans of Russia, but even most Republicans view Russia unfavorably and half consider its military a vital threat. It remains to be seen if this broad agreement influences how Americans react to both the Mueller report concerning alleged Russian interference in U.S. elections and to future Trump policies dealing with Moscow and U.S. national defense. On Thursday, Gallup will release the 2018 World Poll approval ratings of Russia's leadership from 133 countries and areas. Results for this Gallup poll are based on telephone interviews conducted Feb. 1-10, 2019, with a random sample of 1,016 adults, aged 18 and older, living in all 50 U.S. states and the District of Columbia. For results based on the total sample of national adults, the margin of sampling error is ±4 percentage points at the 95% confidence level. All reported margins of sampling error include computed design effects for weighting. Donald Trump's approval rating on the economy exceeds his overall job approval rating by a significant margin, while his ratings on the environment and Russia are significantly lower.